Wow. I just checked and realized the last post in this series was written almost a year ago. Fortunately, that wasn’t the last time this site was updated, though it seems that way at times. I’ll try to do better after GenCon. My imaginary audience needs real articles, damn it! 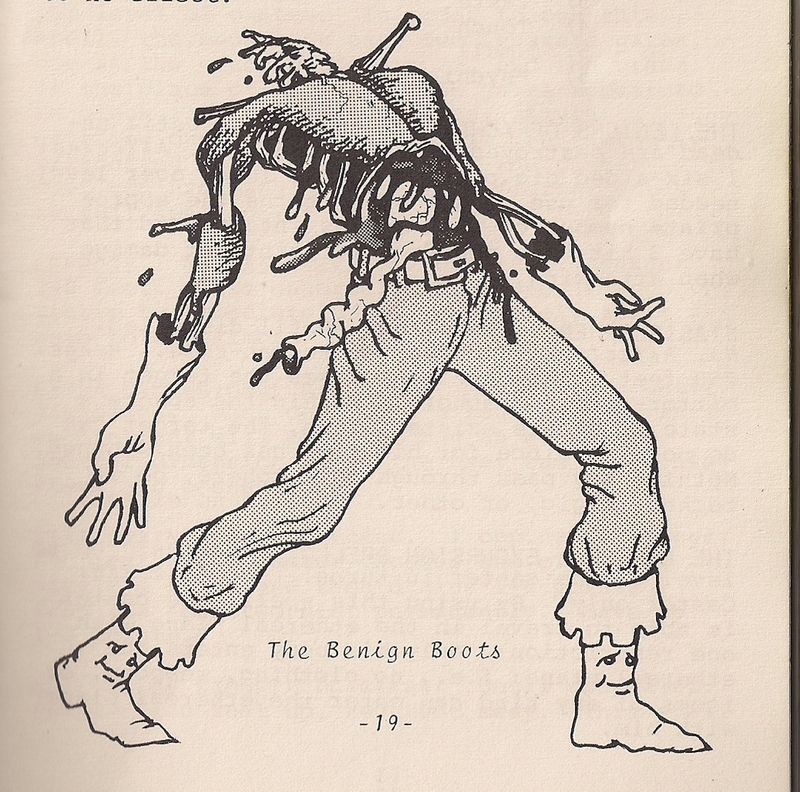 Should I keep y’all in suspense, or should I just jump, right now, to the single best part of this section, and perhaps of the entire book, the illustration for the Benign Boots? Well, unfortunately, I apparently already posted the illustration long before I got here. Also the two articles I mentioned being in progress over a year ago are still in progress. Wow. My laziness astonishes even me. Ah well, here it is again. 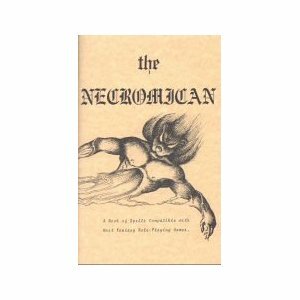 For those just wandering in from some random link, this article is part of a series looking at the wonderful (that should be read, by the way, without sarcasm or irony, because it is wonderful, in every way, full of wonders) classic old-school, and highly unofficial, supplement, “The Necromican” (note spelling, compare to Lovecraft), produced by Fantasy Art Enterprises in 1979. This was one of two such books they produced, which is a deep pity, as they could have gone on to all manner of greatness. The other was the even more astounding and wondrous Booty And The Beasts. This spell creates a 10 foot long spiked club and shoves it straight up the monster’s… wait… no, I’ve seen too many movies with ‘clever’ titles. This spell analyzes the monster, revealing hit points, AC, immunities, and so on. Again, it’s interesting that we see an example of the repeated pattern of spells substituting for missing non-spell mechanics, in this case, some means to measure character knowledge of monsters. (We had two ways to do it. One, the player memorized the Monster Manual, and/or learned by having various characters die, then, through a sort of Akashic memory, having his next character know what killed his previous character, and, two, the DM ruthlessly snarling at you if you showed knowledge your character didn’t have. I don’t remember ever being told to “roll an intelligence check” to determine if my character knew something.) Anyway, this spell might make a lot of sense, but not as an eighth level spell. Even in munchkin games, you did not have high level memorizations to waste on a spell like this. First or second level, sure. It was probably eighth level because “Try to hit the players with a monster they don’t know everything about” was a big part of the meta-game, which was a lot more competitive back then. You’ve seen the picture, now read about the spell! This spell creates magic boots around your feet. When you die, the boots transport themselves and the corpse onto the astral plane and then run at triple speed to a predesignated place of safety. I’m not sure how much good this would do if you’ve been disintegrated or had your legs sliced off, but that’s what DMs are for, to make these kinds of judgments without needing mounds of tedious special-case rules, and then listen to the players whine about them. I suspect the main use for this spell was to get your body away from your fellow adventurers before they looted your corpse. This spell gives you the face of Cthulhu, so, everyone around you passes out with fear and wakes up gibbering. (Save for stun.) It’s not 100% clear if the “wakes up gibbering” is permanent, but it’s strongly implied. Notable mostly for the fact that this book was published two years before Call of Cthulhu really brought Lovecraft’s work front-and-center in the RPG world, and a year before TSR’s Deities and Demigods, which is what introduced most of us ignorant young savages to the Elder Gods. In other words, the Lovecraft references in this and B&TB shows they were ahead of the curve. This spell kills all non-magical plant life in a one-mile area. The description notes “…this spell would not kill ents, but would destroy the forest they were living in.” Yeah. Yeah. How’d that work out for Saruman? Why not just call this spell “Summon pissed-off trees”? This is basically a “drain stats” spell, with the nice special effect of creating a parasite inside the victim’s skull and the text notes that said parasite is only detectible by cutting open the victim’s head and looking inside. I’ll take the stat drain, thank you. These guys. Right here. Or, better yet, any of the horrid undersea things from Booty And The Beasts. You gotta finish this series! The mere fact someone is reading *anything* I post here is enough inspiration. Consider it my top priority while I wait for final art for Rogue Planet.